I got up early last Sunday morning to go get some shots in downtown Austin. I like Sunday morning because it seems most people sleep in on Sundays and therefore things are less crowded for a longer period of time. Or maybe they are in church, but it’s good either way as that means they aren’t in my shots <grin>. Anyways, I found a parking garage that was in a suitable location, climbed to the top, and found some great views of the skyline. 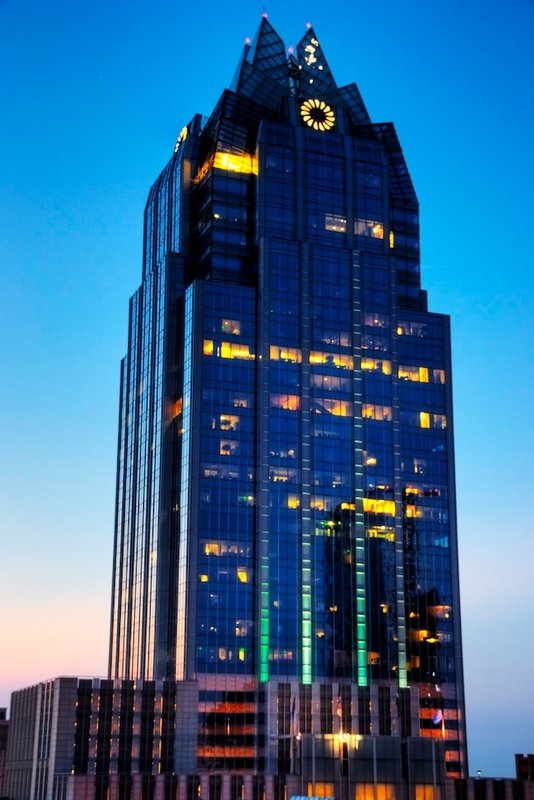 This is the Frost Bank Tower, which stands 515 feet tall and is the 3rd tallest building in town. It was the first high-rise building to be constructed in the U.S. after the 9/11 attacks. I rather like the look of the building, though some folks claim it looks like a giant pair of nose hair trimmers! Nonetheless, the light from the rising sun was great, as blue hour was just wrapping up and I thought the building had a certain glow about it.